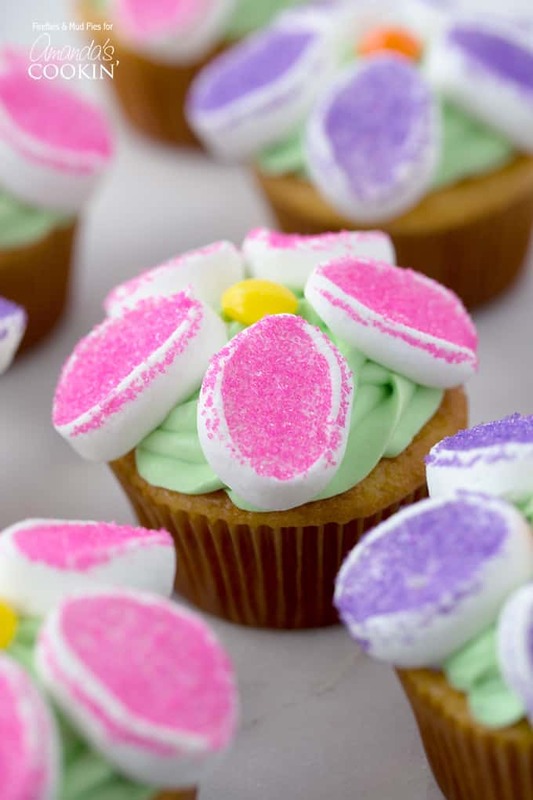 These adorable Marshmallow Flower Cupcakes are perfect for summer parties. With the help of prepared cake mix and creamy frosting, they are easy to make too. These pretty flower cupcakes would be great for a birthday party, bridal shower or baby shower! Arrange them on a tiered cake plate so they look like a cupcake flower bouquet. A cute treat for summer birthdays and barbecues, these flower cupcakes can be prepared homemade or from packaged cake mix and frosting. After the cupcakes were cool, I used a Wilton 2D tip to swirl light green frosting onto them. To prepare the marshmallow petals, use sharp kitchen shears to cut a marshmallow into 3 pieces. Dip the freshly cut sticky side into decorating sugar, then repeat. Kids love to help dipping the marshmallows into the sugar! It takes 5 marshmallow petals to make 1 flower. 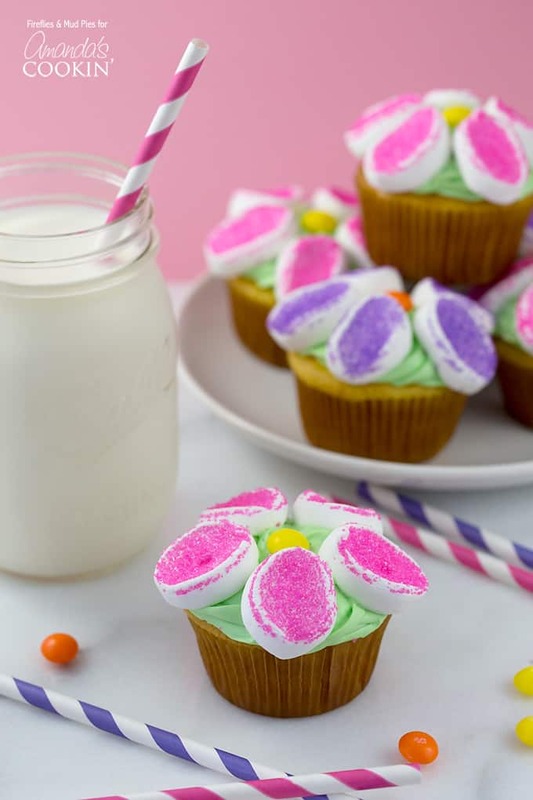 After the marshmallows are arranged on the cupcakes, place a single candy in the middle to be the center of the flower. We used Skittles, but I think Sprees or gumdrops would make lovely centers as well! RELATED: Looking for something more adult? You’ll want to check out these Easy Mocha Cupcakes. 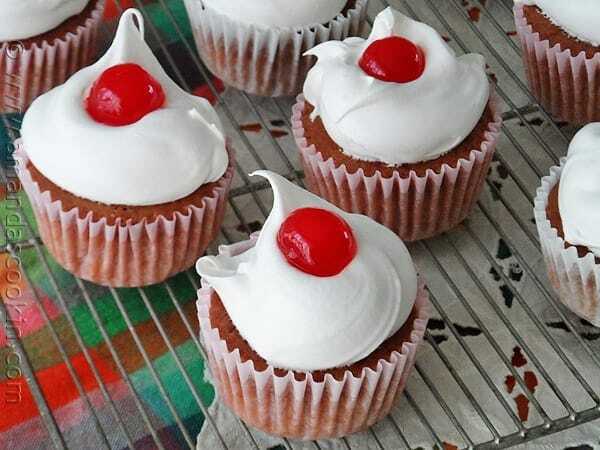 If you enjoy making desserts with cake mix, these 3-Ingredient Cherry Cupcakes are right up your alley. 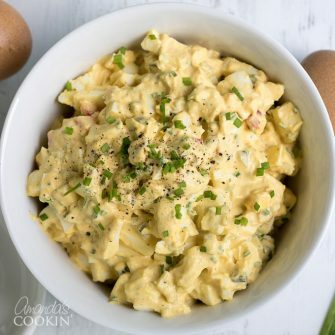 They are delicious, pretty and easy to make! Another party-worthy cupcake recipe is this delicious white chocolate favorite. 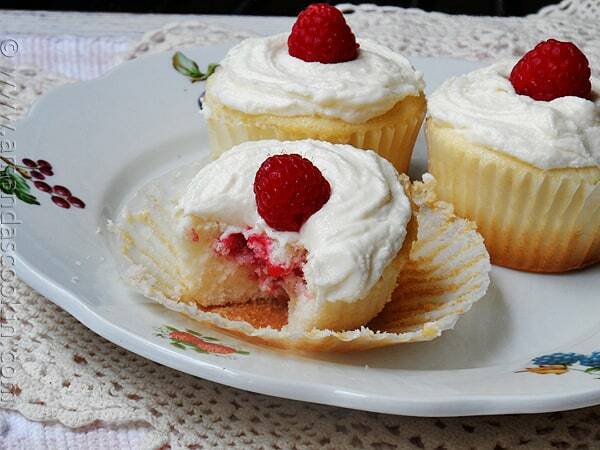 These Raspberry Filled White Chocolate Buttercream Cupcakes are real show stoppers and perfect for a bridal shower! 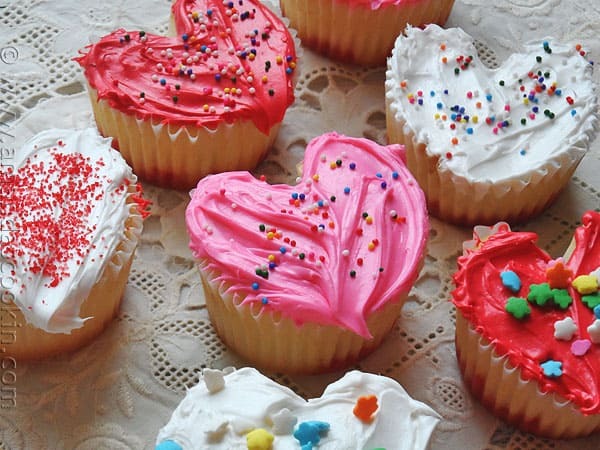 While these are most popular around Valentine’s Day, these heart shaped cupcakes can be served anytime and are great for little girl birthdays or for more romantic occasions like an anniversary or wedding. Simply change up the food coloring to match the bridesmaid dresses or wedding flowers! 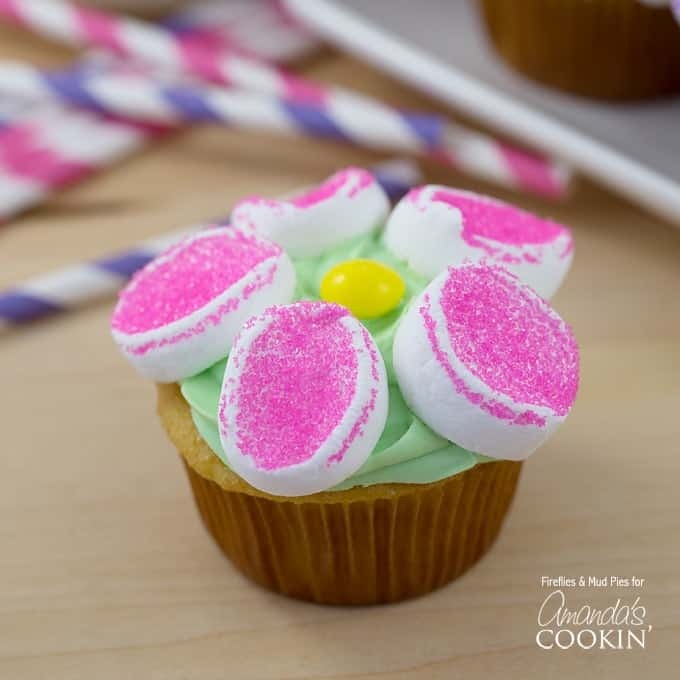 Cute marshmallow cupcake flowers are perfect for summer! Bake the cupcakes according to the package. 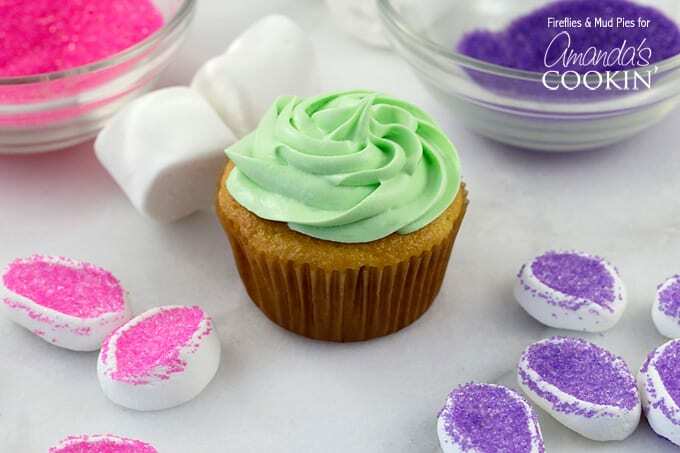 As the cupcakes are cooling, prepare the frosting by adding 2–3 drops of green food dye. 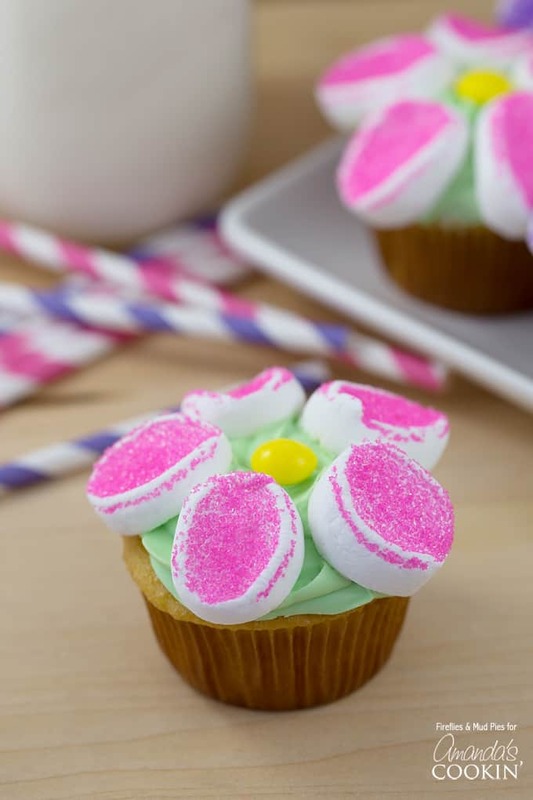 Make the marshmallow petals for the cupcakes by using kitchen shears to cut a marshmallow in half 3 times. It takes 5 petals to make 1 flower. Dip the sticky side of the marshmallows into the colored sugar. Place the marshmallows onto the frosting in a circle, then place a Skittle (or other round candy) in the middle. Repeat until all of the cupcakes are decorated!